really quick... i was fittin my new valve covers and they dont fit because of this baffel type thing that bolts inbetween the rocker sets and i assume in there to sheild the oil spray from the push rods. anyway what im gettin at is, are they nessicary(sp?)? the covers fit SO nice, but i have to take the baffel thing off. yes and no. your car will run without them, but the rockers WILL spray oil up your pcv valve and breather without them. Tube & Collector 1 5/8-1 3/4", 3"
Footnotes 15 Shortie style hedder. Maximum ground clearance. somebody buy these and let us know if they will work!!!!!! you can also use stock exhaust manifolds.. some pontiac manifolds work MUCH bettewr than some shorty style headers. with the exception of weight, of course.. Most people want long tube headers. and if you plan to use subframe connectors, long tubes are definitly the way to go. $100 or so and get those indian adventure long tubes....why wouldnt i? he has them in D-port too. same price tho! 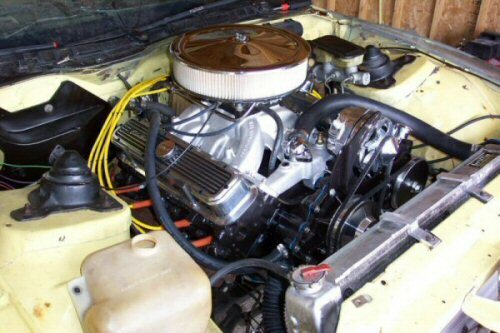 im mounting the tune port on my 72 455 pontiac mtr for my 3rd gen t/a.. any suggestions what injectors i should use?? and how your putting a tpi on a pontiac block?? but if it all works out i would say 30lbers for a close to stock motor, and 42s for a mildly built one. the tpi can be mounted on a torker II intake w some milling work.. you just have to be careful when you drill the holes for the injectors that you dont egg them..
the long branch wont work. the factory k-member is in the way. however if you have some ram-air III factory headers, they will work. but i think if im gonna spend that much money, i might as well spend the extra 100 and get the swap long tubes from IA. the tpi can be mounted on a torker II intake w some milling work..
Can you expand on this. I am researching a TPI solution for Pontiac motors. I am in the process of setting up a motor for my 89 GTA. well guys, im actually almost done with my swap. all i got left is fitment of my indian adventures headers, then im sending them off to be coated.. installation on my spohn th-400 swap crossmember and torque arm, and some misc. wiring. if you guys have any questions feel free. ill do my best to take as many pics as i can this next week. any thermal coatings on the pistons, head cc, or valve faces? no, i have aluminum pistons. and i didnt coat anything else. only thing that will be coated are the headers. hood clearance? What's it like? 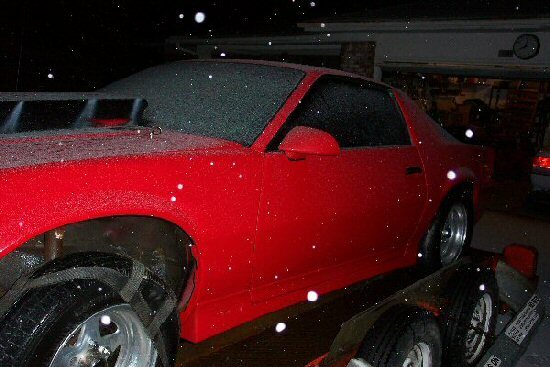 Can you run a tall intake under a firebird hood? What intake/car/air filter you running and how does that clear? Can you take a pic of the installed engine with intake/carb/cleaner? hahah, hood clearance! good joke. no im kidding, if you ran a low-rise intake and a airfilter with a drop base, you MIGHT be able to get it to clear the stock hood. i however didnt realize this untill i had bought all the **** for the build. i have indian adventure motor mounts which you still have about a good 1" inbetween the bottom of the oil pan and the k-member. on the motor i have a edlebrock torkerII, thats a single plane- highrise. and toping it of i have a proform 750cfm. im pretty sure its the same size as a standard holley carb, but its got a billet aluminum throttle plate, and billet aluminum metering blocks. and then just a off-the-shelf 14" round airfilter(i think its a 2" or 2.5" tall filter, not a drop base). ive put a peice of wood across the tops of the fenders, and the whole filter assembally is above that line. and i dont work but one day this week, so ill try to borrow a camara to take some quick shots. FYI, i got the indian adventure headers today!! damn, there nice. some real quaility products! and a quick side shot of as much of the car as i could get in my little 2-bay garage. so now im at this crossroad, do i call up IA and ask them about the clearance problems, or do i try beating my k-member to make them clear? i really dont want to take a ball-peen to the headers. I'd mod the k-member if it were mine; dent it if the problem is minor, or cut and rebox a section if thats not enough. thats exactly what i was planing on doing. and i dont want to deal with cutting/reboxing. i mean it prolly only needs like a 2" long dent about 3/8" down. i think i can pull that off. but i really would rather not pull the motor/trans out. so i have to figure somthing out. 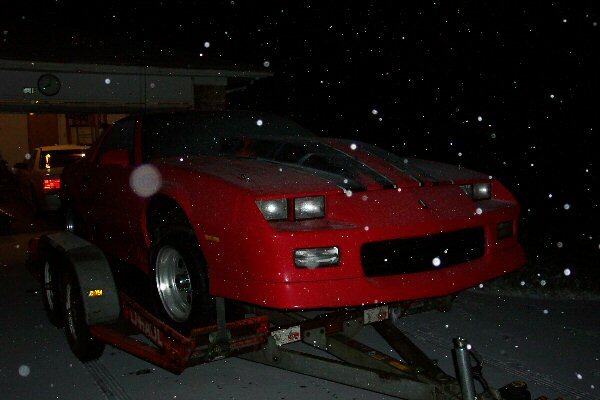 I'm going to be putting a 389 into my 1984 S/E Firebird over the winter here. Right now I'm rebuilding it. Basically just adding myself to this thread so I can get updates emailed to me. I'll post my progress as I go. would a tubular k-member provide enough clearance? Yes, that is what I am going to do on my 87...probably an AJE, or ,maybe a Spohn if they are available in time. I'm getting ready to do this swap. 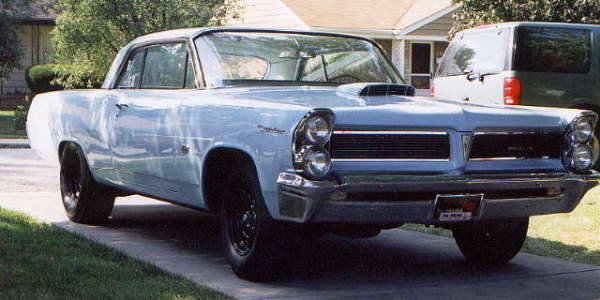 Have a free, running 68 360HP GTO motor. came out of our boat. Lots of good info in this thread. Sorry if i missed it, but one thing i havent seen mentioned is the front springs. What affect does the pontiac engine have on to stock springs/ride height, And what options do i have? This is going in a 92, and the front bumper/air dam already drags going in and out of some driveways. 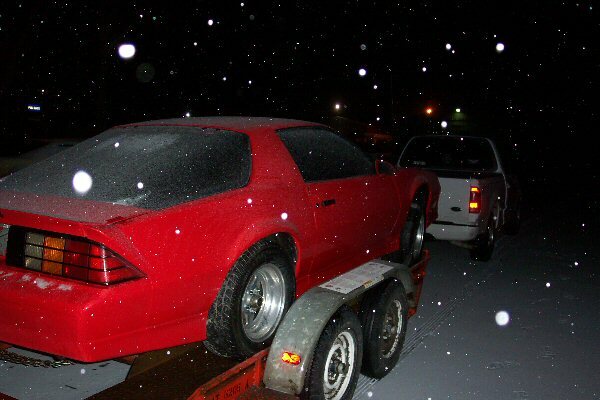 I swapped my 70 455 and 77 th350 in my 85 iroc for around 500$ in parts. i had a custom 3" drive shaft made. wiring was simple. torque arm from jeggs. and i was on. i had to use a 4" cowl hood which i don't like very much. but it's better than the alternative. i had purchased the I.A. headers and they didn't fit .. so i sent them back and opted for a set of, what i am told, are pre 70's GTO exhaust manifolds. there is no power loss compared to the old crappy hedman headers i had on it when it was in a 77 t/a. all in all, it was a very easy swap and one hell of a light to light screamer. wow... just wondering, where didnt the IA headers fit? i just sent mine back, and im currently in contact with them to fix the fitment problem. what kind of exhaust manifolds did you end up using? are they ram air III's? what did you do for the rest of the exhaust? i believe they are ram air III's but i know very little about pontiac. the casting # on one of the manifolds are 977c42-rh2b f. i am sure someone out there knows exactly what that is. lol. i went a few rounds with one of the guys at I.A. about the headers and he assured me that they were made correct and they fit his "jig" that they supposedly make them on and there is no reason that it shouldn't fit my application. i had enough of that and had them refund my money. over 500$ is way too much money for headers that are not coated and do not fit. as far as exhaust. well, that was some ugly home made side pipes. the car i put in into was not a very good car. i had some pics of it on here a while ago in another forum. i'll see if i cant find it and post the link to it. anywho, it was just a car for me to get everything i needed to make it perfect for the next car. which i happened to find last week. Last edited by Kross4031; 11-28-2005 at 08:11 AM. the old thread is gone.. here is a pic of the old car. i'll have some of the new car shortly. just got the new ride home ... here is a couple of pics, just cause. i'll be happy to let anyone know exactly what i did to achieve my 455 swap. how do those ram air III manifolds breath? ya think its pointless to use those vs. headers? i dont think it's pointles to use manifolds vs. headers. obviously headers would be a better way to go if you can find someone to make a good set of equal length headers that FIT! but as i said .. in comparison to the crappy hedmen headers that i had on it. the manifolds provided no gain or loss in horse power. but, with a good set of headers, it would be safe to say that headers would be the way to go. it just this combination is what is working for me. Last edited by Kross4031; 12-02-2005 at 03:09 AM. if ya wouldnt mind me asking, what kind of times are you turning with your currnet setup? i haven't had the old car at the track. taking it to the drag strip never really appealed to me. an example of how quick it is... i raced a 03' vette from a 40 mph roll and pulled it by two car lengths from the start and kept on pulling away up to 120mph. obviously he would have past me by had i kept going .. top end really is not it's strong point. i never took it past 130 although it seemed to have more in it. from a stop .. the thing would never hook up. it still spun the tires from a 40 mph roll, very little, but it still spun em. Last edited by Kross4031; 12-02-2005 at 03:08 AM. it turns out i was way off on that casting number. it is 9777642 - rh2b. as far i can tell they are ram air's and came off of a 67-68 HO 400 GTO. but that is just what i am finding on the net. Last edited by Kross4031; 12-02-2005 at 08:04 AM. Originally posted by [email protected]Can you expand on this. I am researching a TPI solution for Pontiac motors. I am in the process of setting up a motor for my 89 GTA. You might want to research that old concept known as the "ZR2" (89 Corvette, with a 454 Big Block). They took a "Tunnel Ram" intake manifold (find one for the Poncho), fabricated their injector bosses, adapted a Weiand Plenum (pretty much an early 90's concept of the HSR). Last edited by Street Lethal; 12-03-2005 at 07:30 PM. one set of headers i am considering are the shorty headers from hedman. they look like they might work. but i am not ready to throw down the cash for "might work". High Performance Pontiac magazine did a engine-dyno shootout about a year ago I think comparing (going by memory here, so...) factory-style RA manifolds, RA Resto 2.5" manifolds, shorties, and long tubes. Of course, the long tubes were king, but I believe that the 2.5" RA manifolds came in second beating out the shorties. If you haven't seen the article, I probably have that issue stashed somewhere. I am trying to do my research for a Pontiac 400 swap into my 91 Bird. I really would like to mate a 6 speed to it, an aftermarket T-56 is not totally out of the question, but a used 4th gen T-56 is preferable due to the cheaper price. I need any suggestions on what bellhousing to use for this swap. Also what would be better to install an LT1 T-56 or an LS1 T-56 as far as the linkage is concerned. Any help is greatly appreciated. my dad is doing a similar swap in his GTO. hes using this bellhouseing and a LT1 T56. only thing is, youd have to use some hydrolic cluth assembally, from which car, i dont know. yeah.. that's pretty much why i am not in any hurry to replace them just yet. www.chiefmanyhorses.com makes both the motor mount kits and headers for the Pontiac engine to be installed in a Third Gen car. already bought the headers from them and had to send them back because they wouldn't fit. someone else that has posted here has the same issue. yeah, that was me. i sent back my first set, and they said they found someing wrong. so they sent me out a second set, and im having the same problem. i think im gonna return them and just get the ram air restorations' oversized RA3 manifolds.